Home Life: Fresh Starts | Home Style | Style Weekly - Richmond, VA local news, arts, and events. A new year brings opportunities for change. Help from above. If you're feeling spiritually stale, "altar" your environment by creating a spiritual niche in your home. 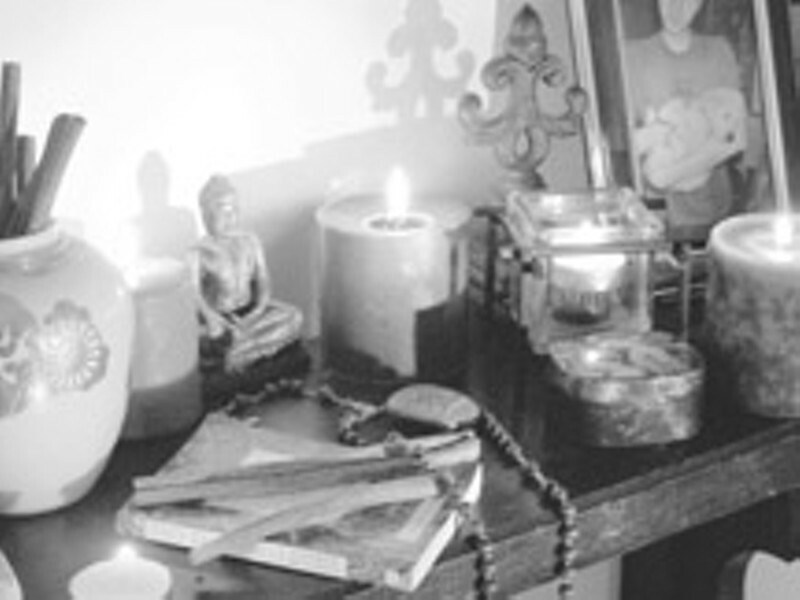 Anything from a mezuzah at the front door to a crucifix to a small altar complete with candles, incense and a Buddha can brighten a room and inspire you to prayer, meditation and other spiritual practices. An edge in the outdoors. Gardeners both reluctant and enthusiastic can get a jump on a beautiful yard by sharpening their tools now for the so-called Valentine's Day Massacre, says Lewis Ginter Botanical Garden horticulturalist John Wise. Thoroughly prune shrubbery around Valentine's Day, and most hollies, boxwood, junipers and other evergreens will be set for the year. Superior cut. Whether you've resolved to spend more time in the kitchen to save money or improve your diet, Mandy Reams at The Compleat Gourmet says a high-quality knife is your best investment for successful cooking. She says Richmond-area chefs currently favor the Shun knife by Kershaw Knives. Love connections. Single and surfing Internet dating sites in your darkened den can feel especially lonely on cold winter nights. Instead, try an activity your dream date might enjoy. Gals, consider a class about plumbing at your local home-improvement store or go snowboarding. Guys, take a knitting class or Jazzercise. Clean and refreshed. If drab décor is getting you down, redo your bathroom. It's the first room you visit every morning. You can invest thousands on a jetted tub, marble tiles and gold fixtures. Or, keep things economical and jazz it up with some paint, stencils, a new shower curtain and towels for less than $100. About face. Maybe "drab" springs to mind when you look in the bathroom mirror. Charles Garner, a manager at the cosmetics store Ulta, suggests revitalizing your skin with a home microdermabrasion kit, such as Neutrogena's Advanced Solutions. You can brighten and renew your complexion without busting your wallet at the spa. Brain boost. Forgot where you left your glasses again? Doing puzzles every day reinforces memory and can postpone the onset of age and disease-related dementia. If crossword puzzles aren't your thing, check out Sudoku, the hot new number-puzzle craze featured daily in the Richmond Times-Dispatch and available in area bookstores. Bedroom magic. A little romance goes a long way toward relieving bedroom blues. Stop trying to guess what might make your partner's heart soar. Instead, exchange lists of 10 romantic surprises that you'd each like to receive. What your sweetie is yearning for will inspire you. Go for it! Time for a pickup. If your dining room table is drowning under stacks of unsorted mail or the Oriental rug in your bedroom has long ago surrendered to the eternal drift of strewn clothes, try baby steps, advises professional organizer Debbie Bowie of Simply Organized. Change one small habit that contributes to the chronic clutter, such as processing the mail every day.